It's not every day that you get to see your name printed on the official EVE Online site - twice on the same day! - and I'm not referring to the forum section and all that CK spam! For this latest issue of EON, I had the pleasure of being tortured by Zapatero to write... let rephrase that. I had the honor of writing about my experience at the EVE Fanfest 2008, which was a first, and hopefully not the last, for me. It was a lot of fun to think back and relive some of those memories in order for me to write that article. Fanfests are an amazing experience, which everyone and anyone involved in EVE should live at least once! Hopefully with the article, I'll manage to share enough of the experience to get your mojo flowing and get you to travel to the top of the world, in a cold, cloudy and humid realm, and have the best time of your life! See you there in November! Here's what else to expect in this latest issue of EON. 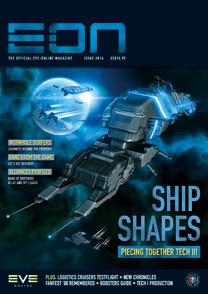 This issue we peer into the imminent future (or look to the very recent past, depending on whether you’re reading this before or after 10th March 09), at the building blocks of the many thousands of potential Tech III ships that will be appearing via explorable wormholes as part of EVE's tenth expansion this coming spring. With CCP providing the parts, we ask how the ships will be glued together, how their attributes will be determined and what special features might make them worth investing in when the time comes. We theorise at what might be at the end of the wormholes themselves that are making Tech III a possibility. After one of the most spectacular Fanfests so far, EVE blogger CrazyKinux re-lives the experience of what was his first; from the puzzled look from friends and family concerned for his sanity for wanting to travel to Iceland to meet a bunch of spaceship nerds, to the mild hangover after four days of blowing away every preconception they had. Without giving too much away, we reckon CK quite enjoyed his first trip to Fanfest. While much of this issue focuses on the future and looking ahead to Tech III, we remember that Tech I still has much to offer: in Testflight, Sivona climbs aboard EVE's unloved logistics cruisers to see if they have a role on the modern battlefield, whilst Karox Lominax escapes the melee and rustles up a guide to manufacturing and production. Congrats to Karox and Flashfresh for being part of this one too. And yes, to you too Winterblink. We all know you crave a good Carebear hug! You've probably heard this a million times so far, but let me say it again. THE ENTIRE EVE-BLOGGING COMMUNITY IS EXTREMELY PROUD OF YOU! I can't wait to read your article, CK, or Flash's or all the rest of this issue! And yes I sure do plan to see you next year at FanFest! Any chance us who don't get E-ON can get your article in here? I tried to subscribe the other day, got my dad to do it and it refused the damn card...despite there being nothing wrong with it. I will find a way CK! I will fiiiind a waaaaaay! Looking back at 2008, the year of possibilities!